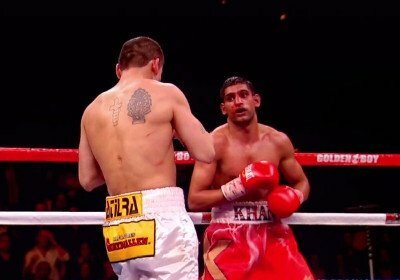 By Michael Collins: Former IBF/WBA light welterweight champion Amir Khan (26-3, 18 KO’s) now has a venue, a U.S cable network carrier and a date for his next fight against lightweight Carlos Molina (17-0, 17 KO’s). Khan, 25, will be fighting Molina on December 15th on Showtime on in the U.S. a the Sports Arena, in Los Angeles, California. It’s a date the conflicts with a Top Rank card headlined by WBO welterweight champion Tim Bradley possibly against light welterweight Lamont Peterson on HBO. As such, the audience for both fights will be much less than could be, not either of the main events are all that interesting. One question you have to wonder about is whether Khan’s promoters at Golden Boy Promotions attempted to sell the Khan vs. Molina fight to HBO first and were turned down? HBO is where Khan’s fights have been televised recently in the U.S, and there have been rumors that they previously turned offers of Khan vs. Joan Guzman and Khan vs. Humberto Soto. If so, then it’s not surprising that they might have turned down Khan-Molina because this fight would seem a much bigger mismatch than those fight. I’d pick Guzman and Soto to beat Molina every day of the week. I rate them as much better fighters than Molina. Not even close. The only thing that I can see that Molina has going for him is an unbeaten record but those wins have come against weak opposition, so it’s really not surprising that he still has an unbeaten record. Khan vs. Molina could possibly have unbeaten heavyweight Deontay Wilder fighting on the undercard, but the card is going to need a lot more than that to attract a wide audience. If Showtime is going to be putting Khan’s mismatch agaisnt the short 5’6″ Molina as the main event then Golden Boy Promotions is going to need to stack the card to make it worthwhile for boxing fans to want to see. The Khan-Molina fight isn’t a compelling one given that Molina has never fought before on Showtime or HBO, and is probably completely unknown to casual boxing fans. Khan also has yet to establish himself as a fighter that can bring in big ratings in the U.S. In the UK, Khan is a big deal and the Molina-Khan fight will be televised on 1HD Sky, but he’s still yet to show that he can bring in big numbers in the United States. Molina is pretty much being brought in for Khan to get a sure fire win and to help build his confidence back up against losing his last two fights to Danny Garcia and Lamont Peterson. It would be risky to put Khan in with a halfway decent light welterweight at this point because his questionable chin makes him vulnerable to getting beaten by any light welterweight with power. This will be Khan’s first fight with new trainer Virgil Hunter, who Khan feels will be able to teach him some badly needed defensive skills. I don’t know how much Khan can learn that he hasn’t during all the years in the amateur ranks and the pros. My guess is the only real change that Hunter will make on Khan is he’ll turn him into a fighter that throws less power punches, who focuses more on his jab and who stops running around as much. However, I have serious doubts that Khan can be a pocket fighter like Hunter’s top guy Andre Ward. Slowing Khan’s movement and offense down will make him, if anything, more susceptible to getting knocked out. We saw what happened to Khan when he stopped and tried to fight the light hitting Peterson in their fight last December. Khan took heavy punishment and was forced to run. I see this as the end result with Khan’s experiment with Hunter. Khan doesn’t seem to move by choice but by necessity. If Hunter tinkers with that we may see Khan lose his next fight even against a light hitter and tiny guy like Molina.